1. Juicing and blending your greens breaks down their cell walls. Greens are amazing in salads, but the only problem with eating them is that your body lacks the enzymes necessary to break down the cell walls of the plant. This makes it so that you are not to be able to extract all the nutrients from those cells. When you take your greens in juice or blended form, those cell walls are removed and you can reap maximum benefit from all the amazing nutrients hidden within the cells. 2. Greens have Chlorophyll. Chlorophyll is one of the best things that you can put into your body! Chlorophyll, when looked at molecularly is almost identical to the composition of your red blood cells, aside from the fact that it has magnesium in the center, as opposed to iron. This means that Chlorophyll is amazing for increasing oxygenation in your body (more oxygen equals more energy for you!) as well as being highly cleansing for your blood. You can even use chlorophyll as an internal deodorant because it is so cleansing for you! 3. Vitamin and Mineral Power! These drinks are amazing for anyone who has poor digestive function. When you juice or blend, you take all the digestive work away from your body, making all the vital nutrients in your fruits and vegetables readily available for your body to absorb and use. This can mean the difference between being partially nourished and being super charged! 4. Green juice and green smoothies will clean out your digestive system. The fiber, chlorophyll, and other nutrients, found especially in greens will clean you out. Did you know that you can store up to 20 pounds of waste in your colon! Yuck! The more things we can do to keep our systems clean the better. 5. 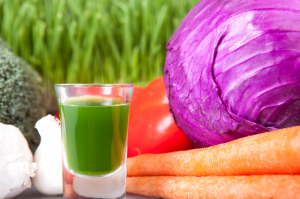 Components of green juice and smoothies have medicinal qualities. Parsley is a blood cleanser. Cilantro pulls heavy metals from the body. Ginger is a carminative, which means that it cleanses the gut as well as healing it. Citrus juice can help fight infection. The more of these powerful foods you put into your body, the better! I hope I have stirred a fire in you to go out and give some green juice or a green smoothie a try. I promise, your body will thank you!